School Spirit is Alive and Well! Last week was quite a week. First we had a wonderful spirit week and some great open houses. I was very proud of all of the high school students for being so respectful of all of the hanging decorations that student council, the cheerleaders, and various other student groups placed around the school. It made for a high school open house that really made it feel like the students owned the building. The pep rally on Friday was fantastic. The colors, skits, activities, cheerleaders, dance team, and staff rendition of the Michael Jackson epic Thriller were perfect, and the students responded with roars of applause that I have not heard in quite some time. We then took to the football field where the Wildcats played extremely well and continued their winning streak. All of our fall sports for that matter are doing very well, and our Marching Band kept Striving for the Highest with another win at Oswego. On Saturday my family and I went to the SU game and watched as an extra point definitely missed the uprights but was ruled good by the review officials. That is the first time I have heard the crowd know that something was wrong but try to clap through it and show confidence to the officials. Apparently it worked, and SU went on to win. On Sunday we had the Race for Respect. What a beautiful day to run. 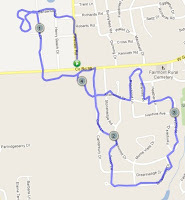 My wife and I decided to run the 4 mile component of the race and I did not get lost. I probably did not get lost because my wife was with me, there were arrows spray painted on the ground, and there were students at each turn pointing to where I had to go. I have included a map of the run from the same GPS that did not help me get un "lost" last week just so you can see where the run takes you if you choose to participate next year. Many thanks to Beth Lozier and the rest of the organizers as well as all of our participants for making it a great day. My family and I then traveled to Buffalo to see a concert by the band the Foo Fighters. You might think that all superintendent's listen to classical music and drink tea and eat crumpets but not me. I am all about a good rock and roll show and they did not disappoint. What is interesting is that thanks to YouTube I watched almost the entire show again and was able to re-live my favorite songs. The entire ride to Buffalo was spent fist pounding as the Buffalo Bills overcame a 21 point deficit to beat the Patriots. This caused the entire city of Buffalo to be in a "good" mood when we got there and certainly exposed my kids to some culture. This week we finish up open houses for the fall, place the final tweaks on how we expect to run things for the rest of the year, and keep enjoying this warm weather before putting on those bulky winter coats. Anyone who knows me knows that I am directionally challenged. When I leave the house on my way to some place unfamiliar there is physical tension that can be felt wondering if I am actually going to make it to my destination. Yes, I have GPS. Doesn't matter. The stress of not knowing where to go, even when I have directions, can be paralyzing at times. My latest misadventure happened the other day when I went for a run. Typically, I try to run 3-5 miles about three times a week. I pick this range because I feel that if I ever need to run from a stray dog, the police (just kidding, I am a role model you know! ), a falling tree, a large rolling rock, or an out of control car, that 3-5 miles should be a sufficient distance. Always be prepared, as the motto says. So I start out for a run and on my way out the door my youngest tells me about a "shortcut" through the woods in one of the neighborhoods that I run in. I was already feeling pretty confident about a trail that I was told about by a co-worker so I thought what could possibly go wrong? Well, I got out about three miles and hopped on the first trail that I already knew about and made it to an area that I had familiarity with. I then employed "the shortcut" (please keep in mind that I have an app on my phone that is keeping track of me on a map that shows all major roads)...(oh and of course I have Lynyrd Skynyrd blasting on Pandora Radio) which involved running on a part dirt, part grass trail. About a half-mile later I find myself in the middle of a woods. About a half mile later I find myself in the middle of a corn field. Never being one to back down, I ran forward and now I am in the middle of a corn field and a lettuce patch (which I thought should have been picked already quite frankly). Next thing my phone beeps to tell me that I have 10% battery life left. I have to stop playing "Freebird" (not kidding) to conserve battery life. Now I am beginning to worry a bit. It is the brink of dusk, I AM NOT LOST, I just don't know exactly where I am, and I am running. I find some power lines that look like they are parallel to a roadway and head for them. Next thing I know I am deeper into the woods/cornfield/lettuce patch. I continued to make my way until I heard the sound of cars. 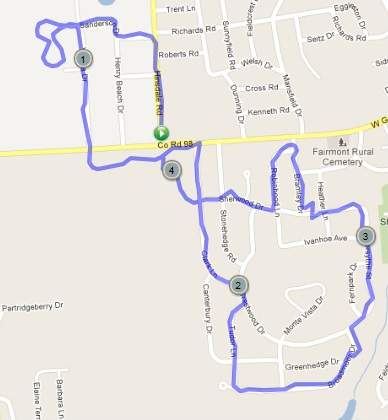 Eventually I found a roadway and finished my run. When I arrived at the house SEVEN miles later I thanked my son for the "shortcut". He asked where I went and he said "no, I meant for you to take the trail on the OTHER street". Never a dull moment. Speaking of directions, my family and I like to geocache. If you haven't heard of it you can go to http://www.geocaching.com/ for complete directions, but in a nutshell you use a handheld GPS or an app for your smartphone and use coordinates provided by the website to find different "treasures" in the woods, near landmarks, etc... There are geocaches all around the world and there are varying degrees of difficulty (some are even under water!). When you find one you usually write your name on a log file and then report it to the website. We have been doing this for about five years and have found about two hundred caches. Over the summer my wife and I decided to take our dog and go find some caches on the Erie Canal trail, near the Sims Store. We headed out and made our way down the trail. We ran into some students, past and present, like Julie Barriere (@juliebarriere), her sister Emily, and one of their friends and compared geocaching notes. They indicated that there was a cache on the other side of the canal. I put the master plan in place by walking the length of the canal down to the Sims Store from the park, crossing to the other side, and walking back to the car on the other side while grabbing the cache that would surely be along the way. Everything was going well until we got to the other side, didn't find the cache, and realized that there was no longer a pedestrian bridge at the lock like there used to be. We had to turn around, walk all the way back to the Sims Store and then all the way back down the other side of the canal to our car. Over 7 total miles. If the dog could talk I am sure that she would have had some choice words. Good clean family fun. The moral of the story is that...well there is no moral to the story. I am terrible with directions, Pandora radio drained my cell phone battery, I made the dog walk seven miles, and somehow I am fortunate to remain married. I am in the best shape of my life though! Over the next few weeks you may hear information from teachers or coaches about ways to run some of the clubs and intramurals that were cut from the budget. Our hope is that through a partnership with the Town of Camillus and some volunteer work that at least some of those opportunities will be restored, and I appreciate your patience through this process. I know that most of this blog has nothing to do with school, but I think sometimes it is okay to reach out beyond these four walls and let people know that I do things just like everyone else except for getting lost. If getting lost was an Olympic sport I would be on a Wheaties box. Enjoy homecoming this weekend as well as the Race for Respect. Let's hope it stays dry! We recently received a completed survey for the wooded lot that we intend to sell in the near future. Now we can give the survey to an appraiser who will officially let us know how much the piece of property is worth. At the same time, we are having an abstract re-created for the property (a legal document that explains the "history of the land"). Once we have the abstract and appraisal completed, the Board of Education will vote to declare the piece of property "surplus" and we can begin the actual sale process. My hope is to have a resolution to the Board by September 21 asking them to declare the property as surplus. My ability to get the resolution to them will hinge on receiving the appraisal back in time. As you know, we are looking for a company or organization to help us determine the best way to redistrict our elementary and middle schools (if you remember from opening day, I indicated that we WILL NOT be closing Onondaga Road Elementary School at this time). We are in the process of writing a Request for Proposal (RFP). This RFP must include exactly what we expect to receive in terms of process and deliverables. The RFP needs to be approved by the Board first and will be presented to them on September 21 for their consideration before it is sent to possible consultants, organizations, and companies. We will then collect all completed RFP's and consider proposals that best meet our needs. One key component will be interaction with the school and community throughout the course of the study. Again, I am hopeful to have some final recommendations for the Board to consider by spring. As always, I will keep you posted as we move forward with this initiative. The Dignity for All Students Act (DASA) is Federal legislation that outlines how our anti-bullying program must look and act. In order to be in compliance, the "DASA" components must be completed by July 1, 2012. We have an active task force working on this legislation and last year the group finished a draft of an anti-bullying policy that should be completed later this month. The task force also approved the use of the Olweus anti-bullying program for grades K-12 (Olweus is an approved program under the guidelines of DASA). Penny Williams from BOCES will help us implement the program. This implementation requires training of ‘staff teams’ in each building which will take place sometime this winter with a follow-up and kick off in late spring and into the fall. Stay tuned for future task force meeting dates. Enjoy your Open House, all of our other events, and have a wonderful week! I would like to thank everyone for a great opening day. All of our staff, parents, and students worked together and made yesterday work very well. Our bus drivers fought through the rain and the first day of their bus runs to pick up and deliver students, and I appreciate your patience as they hone in on the correct pick-up and drop-off times. This process usually takes about a week under ideal conditions and today was already much better than yesterday. We have many different events coming up this weekend. First, on Friday evening our Wildcat Football team will host Corcoran at 6:00 p.m. on the turf stadium. At half-time the Marching Band will deliver their first large public performance of their show, Strive for the Highest. While not the complete show that we will be taken on the road shortly, this version will feature many of the components that will carry us to the Carrier Dome later this fall. The Marching Band sounds very powerful and they have added nearly 40 members from last year. They are a treat to watch. After their performance, members of our modified sports teams along with their coaches will walk a parade “thank you” lap for all of the parents who helped to raise money to save half of our modified sports program from budget cuts. This should be a large turn out, and I am very appreciative of the efforts of all involved that have made this possible. On Sunday, the Marching Band will be holding their Annual Bottle and Can Drive. You will see Marching Band members in their Marching Band shirts collecting bottles and cans in various neighborhoods. At 3:00 p.m. on Sunday in our high school auditorium (doors open at 2:15 p.m.) West Genesee will be hosting a “Remember-Reflect-Renew” free concert sponsored by the Syracuse Chorale to commemorate the 10th anniversary of September 11, 2001. There will be several acts including the Syracuse Chorale, Onondaga Civic Symphony Orchestra, Syracuse Pops Chorus, The Master’s Touch Chorale, Five to Life Acapella, the Syracuse Scottish Pipe Band, and readings by Senator John DeFrancisco and Assemblyman Bill Magnarelli. I will also be on hand to meet and greet concert goers and to provide some opening remarks to kick off the event. Event organizers are anticipating up to 1,000 people for this free event, so make sure to get there early. Time for me to get back into buildings to meet students. If you want a play-by-play of my visits as well as other “hot off the press” information, be sure to follow me on Twitter @cbrownwgcsd. At our opening day with staff last week I spoke about what will be known in our organization as "The Slide of Negativity". This slide contained all kinds of nasty things on it like job losses, the change to Spring Break, testing, etc... I allowed the staff to view the slide for about 15 seconds before turning it to a black slide. I then asked staff to raise their hands if they know of someone with cancer, lost someone on 9/11, or knew someone who does not have a job, needs one, and cannot find one. Almost every hand was in the air, and I would bet that if this exercise was repeated in any public place we would see the same results. While we get upset over changes and hurdles, they simply do not compare to some of the large life-changing events that can creep up on us out of nowhere. Our staff and I will be very composed this year, as we always are, because we understand perspective and will not let the "small stuff" get in the way of doing what we do best; educating your children. It has been interesting to read all of the newspaper articles from around the state and country (I am addicted to reading headlines from different papers on my iPad each morning) related to 9/11, and how we will remember what happened and what we are/will/won't/or don't teach our kids about what happened. I think anyone over the age of 16 probably has some recollection of what happened that day and many of us have deeper, much more emotional memories than others. I found it interesting to read all of the different theories about how we should remember and what we should tell our children because these different points of view explain a lot about what actually happened on that day. Thousands of people from different cultures and backgrounds were working when all of a sudden tragedy struck, twice. Then thousands of people from all different cultures and backgrounds gathered together to help the victims and try to piece together some normalcy, resolve, and resilience. And we did. And we continue to live the way that we are fortunate enough to live. The moral of the story in my mind related to the 10th anniversary of 9/11 is that people need to do what they WANT to do to remember that awful day. If everyone in America remembers 9/11 differently this Sunday it doesn't mean that we aren't solidified in our beliefs or resolve; it means that we all still live in a country where we have the right to to what we want even after some people tried their best to take that away from us. My continued thoughts for all who lost their lives or a loved one and my thanks to all who helped to bring the site and a Nation back together. Last weekend a group of individuals (who would like to remain anonymous) collected school supplies for families. They collected many different things and were able to supply back packs to many needy families (well over 100). They were not able to fill all of the orders and unfortunately had to leave some without. We are continuing to work to possibly fill those orders for people. My thanks goes out to the dedicated unnamed individuals who gave their time and energy to help our many needy people and if a second phase is able to happen, I will let you know. Wednesday is almost here and I am looking forward to watching Kindergartners get off the bus!